Ivishow (Gen 2) Smart Key Finder Anti-lost Tag, Bluetooth Phone Finder Mini GPS Locator Tracking Device with IOS/ Android App[0-30M Anti-Theft Burglar Alarms] for Wallet, Keychain, Kids, Pets (2-pack) by Ivishow® at iShare Maps. MPN: IVS-BTW. Hurry! Limited time offer. Offer valid only while supplies last. 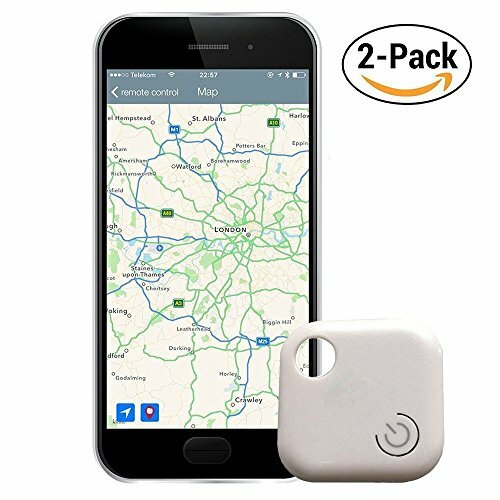 Easy to Use: The smart Bluetooth tracker come with easy-to-use App [Premium manage 10 trackers]. Never lose your important things AGAIN! Like keys, cars hidden, wallets, luggage, purses, backpacks, cameras, remote controls, kids toys and anything you don't want to lose. Find Each Other: Once paired to your smart phone, this device effectively allows both your phone and the Tag tracker to ring each other; Note: When the tracker is more than 30 meters away from the phone, it will disconnect and no longer alert you. Anti-lost & Anti-theft: Both the Tag and your phone will beep to alert you when they disconnect from each other. See Where You Left It: The Partner Tracker App records the last time and location of the last connection, so you know where to start searching for your misplaced belongings. What You Get: 1* Ivishow Smart Bluetooth GPS Tracker (CR2032 battery included), 1* User Manual; our fan-favorite hassle-free 18-month warranty and friendly customer service. If you have any questions about this product by Ivishow®, contact us by completing and submitting the form below. If you are looking for a specif part number, please include it with your message.